Its lunch time, you're hungry. You reach for a banana but you see that many tiny flies have had a similar idea! You try to swat them away but somehow they manage to outmanoeuvre and outwit you. These little creatures are fruit flies. Although they may be a nuisance to you, they are greatly appreciated by scientists around the world. Known to the scientific community as Drosophila melanogaster, they are invaluable tools in the lab. They have assisted in our understanding of genetics, neural development, diseases such as cancer and motor neuron disease, and much more. The Philipsborn lab in Aarhus University use fruit flies to understand the general mechanisms and principles of nervous system function, essentially how our brains work. Even though fruit flies are incredibly small, they have roughly 200,000 brain neurons generating sophisticated behaviours such as learning, decision making, aggression and sleep. Perhaps most impressive in the fly's behavioural repertoire is its flying ability. They can whizz through the air with astounding agility, integrating sensory information, performing fast twists and turns- it's no wonder that they are too fast for us! Of course we all know that a fly uses its wing for flight, but you may not have known that a male fly can also use its wings to sing. Ultimately, the principle objective of a male fly is reproduction, producing as many offspring as possible. Therefore, when a male meets a female fly he tries to mate with her. He seduces by chasing her and vibrating a wing to sing. But the female needs some persuasion, she will only accept a male who sings a good quality courtship song which has rhythm and tune. 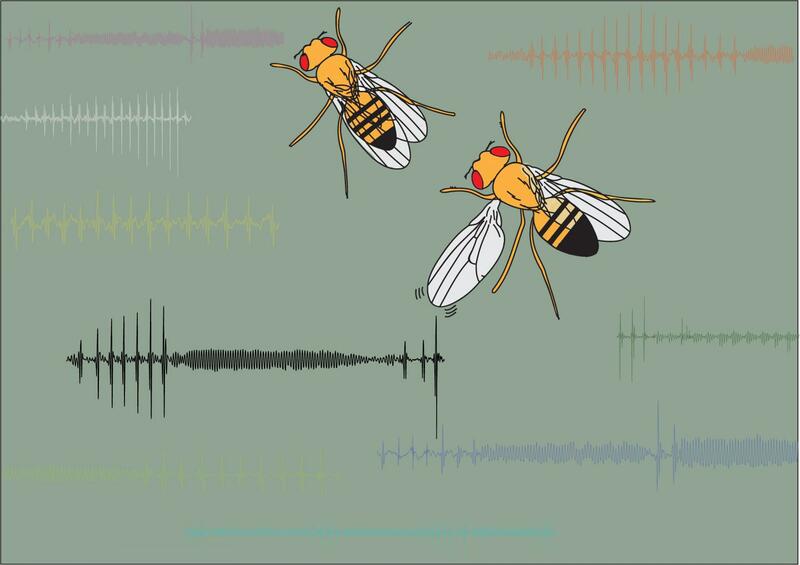 The female fruitfly can of course hear this song, but it is too weak for the human ear, so researchers must resort to small microphones and amplifiers to perceive the sound. How does the male frut fly generate his song? Angela O'Sullivan, a PhD student in the Philipsborn lab, studies how the male generates this song. By examining the muscles and motor neurons needed for moving the wing in a highly controlled way, we can start to understand more general questions on how the nervous system generates complex motor patterns and uses one output system for very different behaviours. Using cutting edge imaging techniques, the researchers peek through the fly's exterior, viewing in real time the activity of muscles and neurons while the fly is singing. They also use genetic tools to manipulate individual motor neurons, visualising the motor neurons and investigating song errors which arise due to silencing of certain neurons. In a recently published paper, O'Sullivan and her colleagues reveal novel findings on the song motor circuit. They find that male flies with defective wing motor systems sing a faulty courtship song and are likely to have difficulties flying. Furthermore, they discover that certain neuromodulators are important while the wings are used for flight as opposed to song. The song serves as an honest signal; it is the male's way of publicising how fit he is. Flaws in the timing or patterning of the song indicate neuromuscular deficits, which in most cases also lead to problems flying. Thereby, it pays to be a fussy female. Many questions remain unanswered regarding this innate behaviour, but with continued research we will learn a lot more and in the process uncover new knowledge on how brains in general function, which in the longer term may have medical significance.